Rodama: a blog of 18th century & Revolutionary French trivia: Voltaire, vegetarian? In 2014 a collection of Voltaire's "pensées végétariennes" were edited by Renan Larue, a professor of French and Italian at the University of Santa Barbara. According to Professor Larue, vegetarianism is a scattered but persistent theme in Voltaire's writings from the 1760s onwards. His interest was stimulated by his own dietary concerns and his reading, particularly of the Neoplatonic philosopher Porphyry, whose treatise on abstinence from eating meat was translated into French by the the abbé de Burigny in 1761. As Professor Larue himself admits, Voltaire's treatment is limited; it was always subsiduary to his battle against religious hypocrisy and his continued, unresolved meditations on the problem of evil in the world. I admit I was a little sceptical that Voltaire really cared much about animals or entertained "vegetarianism" at all; but Voltaire surprises. The passages which Professor Larue has assembled give impressive evidence of his willingness - perhaps unique among 18th-century writers - to empathise with the plight of butchery animals. Although he may not have considered vegetarianism as a serious option for modern men, his defence of historical vegetarians seems to go well beyond the immediate requirement of anti-Christian polemic. Animals and humans – the starting point. The main thrust of this philosophy, of course, was to dethrone men from their privileged place in creation and to challenge the, to Voltaire vacuous, concept of an immortal soul. In late works, however, Voltaire seems increasingly willing to emphasise the corollory, that men should have regard for the experience and welfare of animals. In one of his last major essays, Il faut prendre un parti ["We must take sides"], composed in 1772 or 1773, Voltaire takes the human capacity to empathise with animal suffering as the very starting point for his discussion of the problem of evil: "We have never had any idea of good and evil, save in relation to ourselves. The sufferings of an animal seem to us evils, because, being animals ourselves, we feel that we should excite compassion if the same were done to us". The suffering which Voltaire has specifically in mind is being killed and eaten. He depicts a nature red in tooth and claw. All creation is caught up in a violent and brutal ecological cycle: "From the smallest insects to the rhinoceros and the elephant the earth is but a vast battlefield, a world of carnage and destruction". "What can be more abominable", concludes Voltaire, "than to feed constantly on corpses?" Elsewhere, Voltaire is more inclined to emphasise human responsibility for the suffering of animals, Again he singles out slaughter and butchery. Men are blinded by habit from seeing "the awful destiny of the beasts that are intended for our table": "Children who weep at the death of the first chicken they see killed laugh at the death of the second". The article "Viande" in Questions sur l'Encyclopédie asks:"What barbarous person would roast a lamb, if that lamb could plead with us in a moving discourse not to be both assassin and cannibal?" "An accursed servant took me over her knees, stuck a long needle in my backside, seized my womb twirled it around the needle, ripped it out and gave it to her cat to eat"
"I am peaceable and have never done any wrong; I have even nourished these monsters by giving them my eggs. Why should I be castrated, blinded, beheaded and roasted?" Is there an alternative to"this frightful habit, which has become part of our nature"? Voltaire is pessimistic about the likelihood of modern men adopting vegetarianism. Predictably, his most scathing comments are reserved for the prevarication and hypocrisy of Jewish and Christian dietary laws; under guise of abstinence, monks have given up meat only to become "murderers of soles and turbots, if not of partridges and quails." Genuine vegetarianism has, however, existed. Voltaire's first example is the faraway civilisation of Indian. His interest in India and the religion of the "Brahmins" dates back to the 1740s, but at this time he had very little information, other than the Jesuit letters from missions, the Lettres édifiantes et curieuses. He was aware of Indian respect for the cow, but interpreted it as the result of a belief in metempsychosis; the Indians feared they might be harming the souls of their dead relatives. It is this position that was parodied in Zadig. By the 1760s, however, Voltaire had acquired new source material, including the so-called Ezour Veidam, a manuscript supposedly from the time of the Vedas, which presented the religion of the Brahmins as a simple monotheism, devoid of superstition. In Voltaire's view this included genuine vegetarianism. Thus in the Princesse de Babylone (1768) the shepherds of the Ganges are said to live in perfect equality and never kill their flocks; it is considered a "horrible crime" to "kill and eat ones fellow creatures". In the Lettres d'Amabed (1768) a Jesuit missionary excites hatred because he is capable of "murdering chickens". 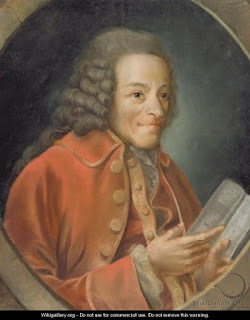 Voltaire also revisited the longstanding idea of an Ancient Greek vegetarian tradition, which started with with Orpheus and including Pythagoras and his disciples. In 1761 the abbé de Burigny sent him a copy of the treatise of Porphyry who henceforth acquired pride of place among Voltaire's vegetarians. At all times, Voltaire asserted, there have been sects prepared to embrace vegetarianism on grounds of religious scruple. None of this is to say,of course, that Voltaire entertained vegetarianism as a serious personal option. If he abstained from meat it was for dietary reasons; on occasion he humorously bemoaned the necessity of following "the regime of Porphyry" but he never saw it as an ethical choice. At the time that he wrote his Dialogue of the capon and the hen, the livres de compte at Ferney show that he bought a considerable amount of meat and fish, and often offered fine meats to his guests. 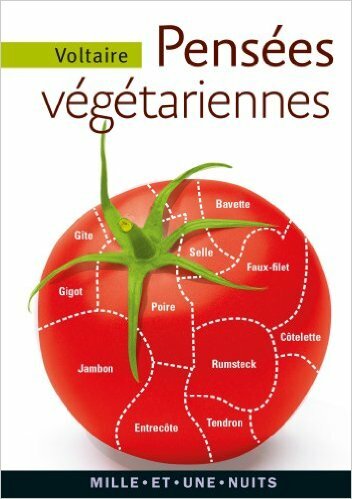 Renan Larue, "Le végétarisme dans l'oeuvre de Voltaire (1762-1778)"
Jim Chevallier, Vegetarians in Old Regime France (2009) 16p. We have never had any idea of good and evil, save in relation to ourselves. The sufferings of an animal seem to us evils, because, being animals ourselves, we feel that we should excite compassion if the same were done to us. We should have the same feeling for a tree if we were told that it suffered torment when it was cut; and for a stone if we learned that it suffers when it is dressed. But we should pity the tree and the stone much less than the animal, because they are less like us. Indeed, we soon cease to be touched by the awful destiny of the beasts that are intended for our table. Children who weep at the death of the first chicken they see killed laugh at the death of the second. It is only too sure that the disgusting carnage of our butcheries and kitchens does not seem to us an evil. On the contrary, we regard this horror, pestilential as it often is, as a blessing of the Lord; and we still have prayers in which we thank him for these murders. Yet what can be more abominable than to feed constantly on corpses? Not only do we spend our lives in killing, and devouring what we have killed, but all the animals slaughter each other; they are impelled to do so by an invincible instinct. From the smallest insects to the rhinoceros and the elephant, the earth is but a vast battlefield, a world of carnage and destruction. There is no animal that has not its prey, and that, to capture it, does not employ some means equivalent to the ruse and rage with which the detestable spider entraps and devours the innocent fly. A flock of sheep devours in an hour, as it crops the grass, more insects than there are men on the earth. What is still more cruel is that in this horrible scene of reiterated murder we perceive an evident design to perpetuate all species by means of the bloody corpses of their mutual enemies. The victims do not expire until nature has carefully provided for new representatives of the species. Everything is born again to be murdered. Yet I observe no moralist among us, nor any of our fluent preachers or boasters, who has ever re-flected in the least on this frightful habit, which has become part of our nature. We have to go back to the pious Porphyry and the sympathetic Pythagoreans to find those who would shame us for our bloody gluttony; or we must travel to the land of the Brahmans. Our monks, the caprice of whose founders has bade them renounce the flesh, are murderers of soles and turbots, if not of partridges and quails. Neither among the monks, nor in the Council of Trent, nor in the assemblies of the clergy, nor in our academies, has this universal butchery ever been pronounced an evil. There has been no more thought given to it in the councils of the clergy than in our public-houses. Hence the great being is justified of these butcheries in our eyes; or, indeed, we are his accomplices.